Ceuta is, along with Melilla, a Spanish exclave on the northern coast of Morocco. Geographically the town is situated in Africa, but it belongs to Spain and is therefore a legal part of the EU. Here, at the Strait of Gibraltar, only a few kilometers separate Africa from Europe. Since the 1990s irregular immigrants coming from African countries have tried in Ceuta to put their feet on European soil. Ceuta, with about 75.000 inhabitants, is one of the last bastions of Spanish hegemony in Morocco, and as such is heavily guarded. Also, from a European strategic point of view, Ceuta needs special protection. In 2005 the EU set up a fence and fit it with barbed wire and surveillance cameras to guard the border against irregular immigrants. The fence was supposed to mark clearly that it wasn’t that easy to enter “Fortress Europe”. At the same time, on the political level, the way into Europe from the outside became more difficult. 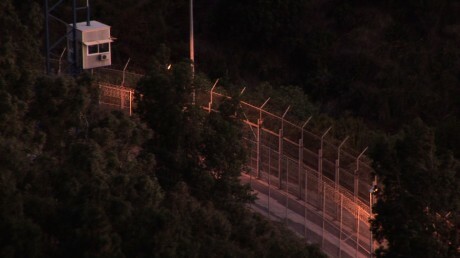 Spain tightened its immigration law with exceptional arrangements for Ceuta and Melilla. According to existing legal regulations, a person applying for asylum could move freely within Spain- from this point, this was no longer an option in Ceuta or Melilla. Immigrants have to stay inside the exclaves during the whole process of the examination of their asylum proposal. And that can take a while. So Ceuta is not a temporary transit, but place of a lengthy involuntarily stays – a sweet prison, as many immigrants call it. The journey into Ceuta in some cases takes months and years, and is often life-threatening. Some people can manage to cross the fence, as like Sekou did. Others pay a lot of money to traffickers to bring them hidden under a car’s dashboard across the border into Ceuta. Still others try to swim around the boundaries at sea or come across in a zodiac like Blade Cyrille. But even after all these troubles the trip doesn’t end in Ceuta… the waiting starts here.